The Candidates – shake hands! 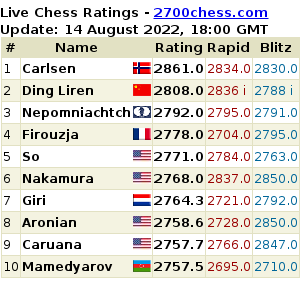 It has been an intense first week for the players and for the chess community on Twitter. And every day more and more tweets about the event in Khanty Mansyisk are posted, which is good for the future of this blog! In the round 6 report you can read a lot of tweets about handshakes. Or the missing handshake, if you like. But we don’t need to see this before the start of a chess game, do we? And it is hard to believe, but there is even a “Stop handshaking Website”: http://stophandshaking.com. Today, one day after the game Topalov-Kramnik, @SilvioDanailov , who is president of the European Chess Union and Topalov’s manager tweeted: “BTW,I don’t understand the hysteria about the handshake.If two persons dislike each other,why do they have to fake it and pretend?” #Hypocrisy. And he added later: “Personally,I don’t shake hands or even say hello to Makro&friends “FIDE” for years,feeling great about it. Unfortunately,hypocrisy is fancy”. In case the players decide to shake hands in round 13, on 29 March, when Kramnik and Topalov meet again, there is plenty of time to practice the “perfect handshake”. (click to enlarge).